Karen René Peters is an Artist and Owner of Lovely Roadhouse Rags/Rocking Rags, a seller of unique vintage jewelry designs and online vintage products. Ms. Peters currently oversees several companies, meets with product pickers and chooses items to put on sale, such as costume jewelry, antique bags and clothing, and conducts online research. She also posts items, with research and price included. She also designs and makes special jewelry orders for personal use or event promotion. With her degree in theater, she began her professional life by starting five community theaters in the Midwest and Northwest. She learned graphic arts as an assistant to the Fashion Arts Manager at the Dayton Corp. She moved to a warmer climate and into supporting the arts community in Austin, Texas, through Designer Space, creating affordable studio space for local artists, as well as volunteering for the local Zachary Scott Theater. She worked six years for the State of Texas as an executive assistant to the director of equities at the teacher retirement system of Texas, moving from there to a private commodities company. She later experienced a career transition, wanting to focus on her music and design. 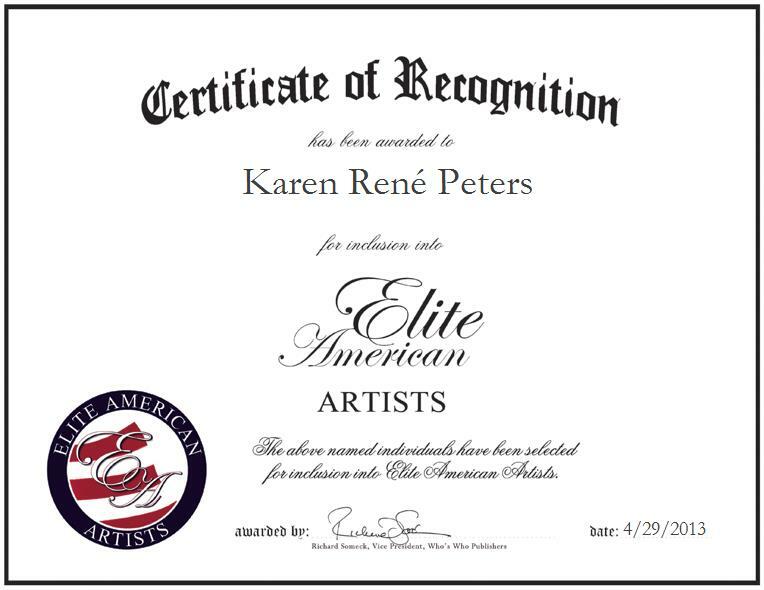 For more information about Karen René Peters, please visit her LinkedIn page.